We face the prospect of Charles Rennie Mackintosh’s masterpiece being demolished because the fire damage was so great, and of it existing only in drawings and memory. Perhaps it can be rebuilt to Mackintosh’s plan, but the value of reproducing everything exactly as designed in 1897 is doubtful, and it seemed to me that some of the spaces inside, however interesting, beautiful or historically important, might be unsuitable for a 21st century art school. I went back to Pevsner’s decription of GSoA in Pioneers of Modern Design. As it can’t be bettered, I thought I’d reproduce it here. “... For in Glasgow there worked during these very years a group of artists as original and as imaginative as any in Europe. In painting, the Glasgow Boys, Guthrie, E. A. Walton, Lavery, Henry, Hornel, and so on are well enough known. Their ﬁrst exhibition abroad impressed Europe considerably. But in design and decoration the ﬁrst appearance of the Glasgow school at an exhibition in Vienna in 1900 was a revelation. “The centre of the group was Charles Rennie Mackintosh (1868- 1928) with his wife Margaret Macdonald and her sister Mrs McNair. In dealing with him, we are able at last to link up the development in England with the main tendency of Continental architecture in the nineties, with Art Nouveau. 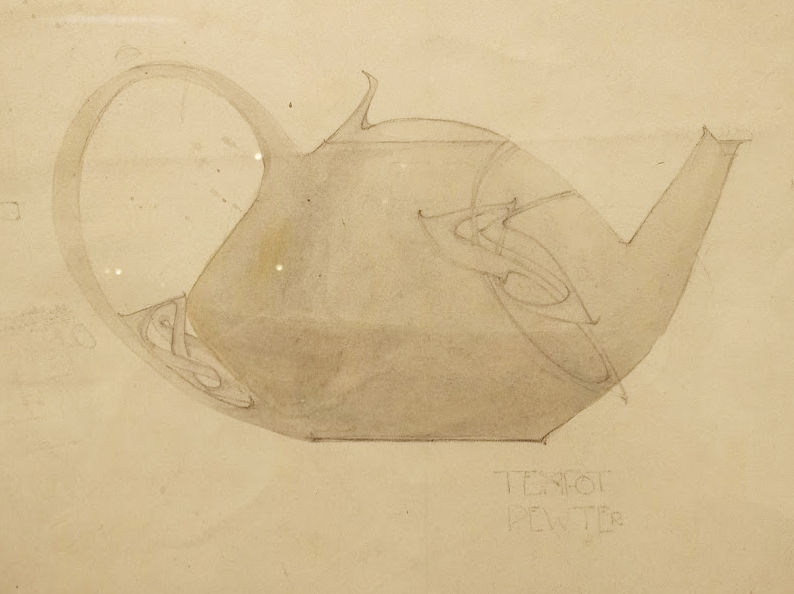 Before he was twenty-eight, Mackintosh was chosen to design the new building for the Glasgow School of Art, a remarkably bold choice due largely to the principal Francis H. Newbery. The designs date from 1897; the ﬁrst part of the building was completed in 1899. Not a single feature here is derived from period styles. “The facade is of a strongly personal character and, in many ways, leads on to the twentieth century, although the entrance bay with balcony and short turret is deliberately fantastical and not unlike Townsend’s contemporary work. But the rest of the front is extremely simple, almost austere in its bold uniform fenestration. In the horizontal windows to the ofﬁces on the ground ﬂoor and the high studio windows on the upper ﬂoor, no curves are admitted; unbroken upright lines prevail even in the railing in front of the building, counteracted only by a few lighter and more playful Art Nouveau ornaments at the top. The same contrast exists between the rigidity of the upper-floor windows and the strange metal stalks at their base, functionally justiﬁed for putting planks on to facilitate window cleaning. However, be that as it may, this row of metal lines reveals one of Mackintosh’s principal sources and at the same time one of his most characteristic qualities. The source, particularly telling in the strange balls at the top of the stalks, with their intertwined tentacles of iron, is clearly the Celtic and Viking art of Britain, as it became familiar beyond the circles of scholars just at this time. The quality equally eloquent in the balls and the stalks is Mackintosh’s intense feeling for spatial values. Our eyes have to pass through the ﬁrst layer of space, indicated by the stalks and balls before arriving at the solid stone front of the building. The same transparency of pure space will be found in all Mackintosh’s principal works. The ground plan of the building is clear and lucid, showing in another light the architect’s interest in space, an interest rare among artists of Art Nouveau. “One more instance may be given to prove that this is really the keynote of Mackintosh’s creation: the interior of the library of the Glasgow School of Art, which forms the centre room of the west wing, planned in 1907. The simple motif of a high room with aisles and galleries around three sides is so enriched that the resulting impression is an overwhelmingly full polyphony of abstract form. The galleries do not project far enough to reach the pillars which separate ‘nave’ from ‘aisles’. Horizontal beams are inserted to connect the walls with the pillars and to support the galleries. Airy balustrades, Art Nouveau in detail, run from the parapets of the gallery to the pillars. Their sole purpose is to offer interesting perspectives. Curves, rare and all the more expressive in Mackintosh’s earlier work, have now completely disappeared. Uprights and horizontals, squares and oblongs determine the effect. “This and the number of fascinating vistas which the architect has achieved here and in another principal work of the same period, the Cranston Tearoom in Sauchiehall Street, 1904, show him as the European counterpart of Frank Lloyd Wright and one of the few true forerunners of the most ingenious juggler with space now alive: Le Corbusier. Le Corbusier once confessed that his desire in building is to create poetry. Mackintosh’s attitude is very similar. Building in his hands becomes an abstract art, both musical and mathematical. Glasgow is celebrating the 150th anniversary of the birth of Charles Rennie Mackintosh and we went to see the Hunterian Gallery’s reconstruction of the house he designed for himself at Southpark Avenue, the exhibition at the Kelvingrove Museum about the Glasgow Style, and The Hill House, his most important domestic project, made for the publisher William Blackie. All the photos here were taken at Hill House, except the last, taken at Glasgow Art School. Mackintosh lived at Southpark Avenue in the later years of his partnership with Honeyman and Keppie and just as he began to practice on his own, so the house was his business card. He and his wife remodelled it, added doors and windows and commissioned furniture, fittings and textiles. It was designed to be airy and open, they used pattern sparingly and most of the rooms have white walls. A rare innovation was fitted carpets, made from stitching together narrow-loom runners. 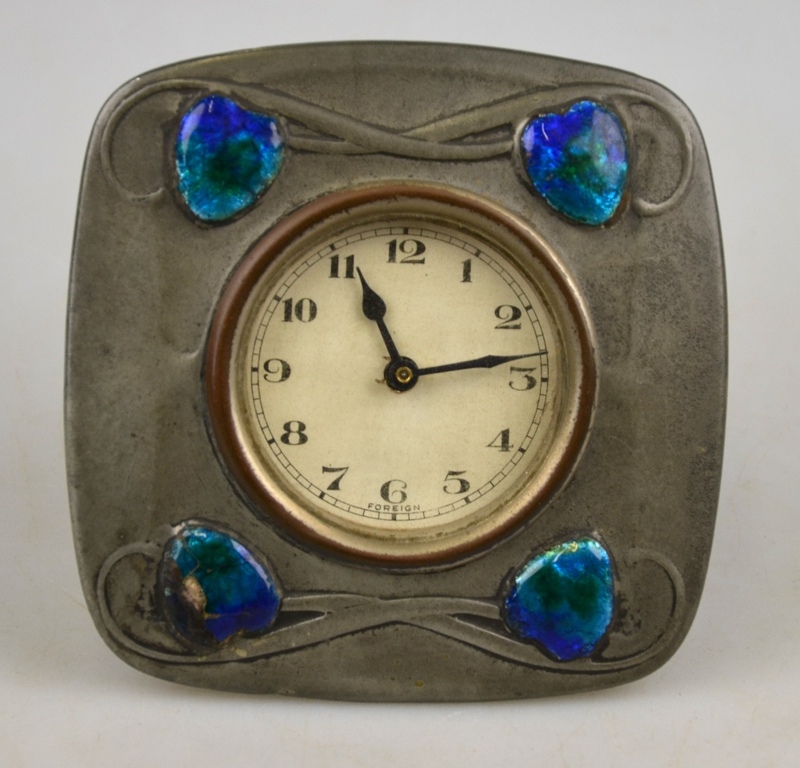 The effect is forward-looking and modern and strikingly different from the busy Arts and Crafts style popular in England at the time. His buildings are so iconic that it is surprising to find that Mackintosh was not successful in Glagow and was more appreciated in Vienna, where he influenced the Secession and the Wiener Werkstätte. The Blackie family loved Hill House and lived there until the 1950s. Mackintosh was meticulous and demanding and the Glasgow Art School was horribly late and over budget. The Art School is still covered in scaffolding as it undergoes major repairs following the fire. Kingston Museum, Surrey, has an exhibition of rarely-seen work by Denise Wren and the Knox Guild. 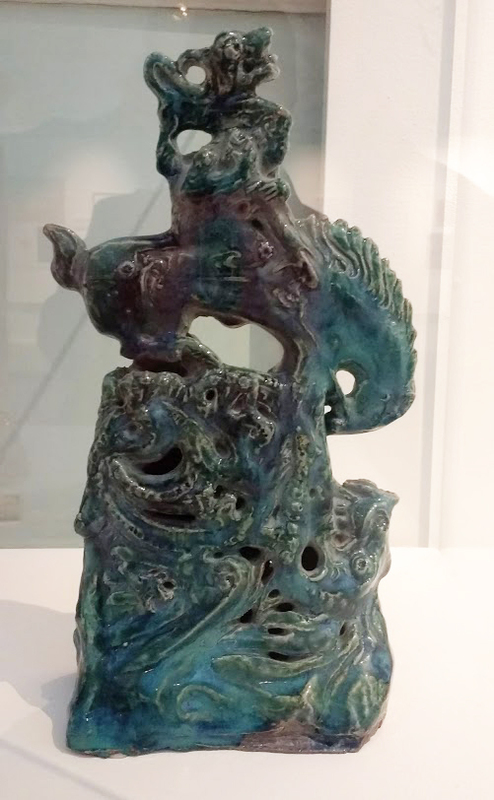 Wren (1891-1979) was a founder of the Craft Potters Association (CPA), the leading British group of studio potters, and was well-known among older potters, but the Kingston Museum displays work from her archive that reveals her as a significant designer in several other media as well. Little has been written about her, so this is a valuable show. Wren was one of the pioneers of studio pottery in Britain. 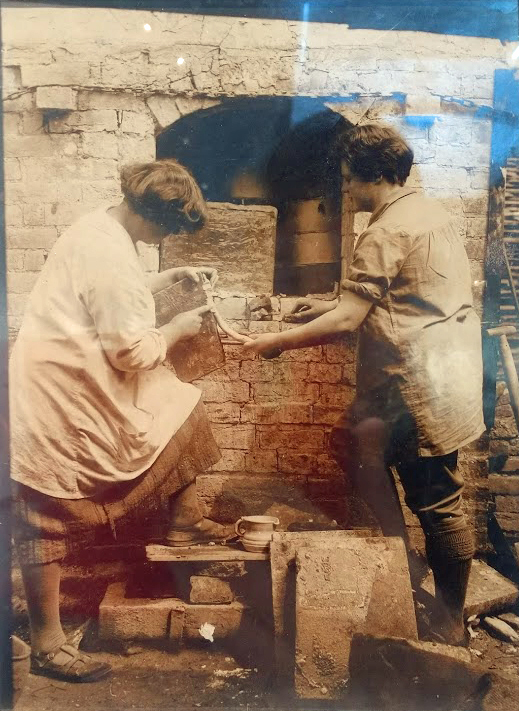 It is interesting to note the women who played an important role in its early days: Dora Lunn, Dora Billington, Stella Crofts, Nell Vyse, Nora Braden and Katherine Pleydell Bouverie. Most of Billington’s students in the 1920s and 1930s, so far as they can be identified, were women. * Bernard Leach’s brand dominance in studio pottery from the 1940s to the 1970s tended to obscure the role of women. We are fortunate that Wren never threw anything away. Her archive contains designs for fabrics, jewellery, silver, pewter and posters as well as pottery. 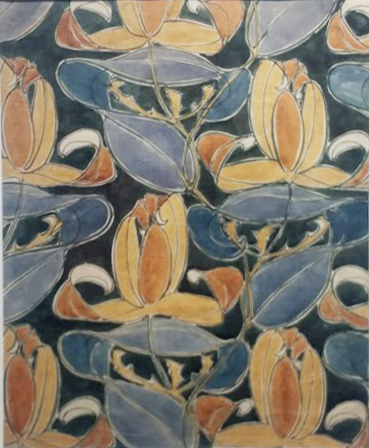 Her designs in the 1910s and 1920s were strongly influenced by Archibald Knox’s Art Nouveau and Celtic motifs. In the 1950s she had commercial success designing fabrics for Tootal. Archibald Knox (1864-1933) designed extensively for Liberty’s and was a charismatic teacher at Kingston art school. His methods were not approved of by the school inspectors, who it appears were still wedded to the drawing syllabus of the old government art schools, and he resigned suddenly in 1911. Wren and some other students also resigned in protest and formed the Knox Guild in honour of him. 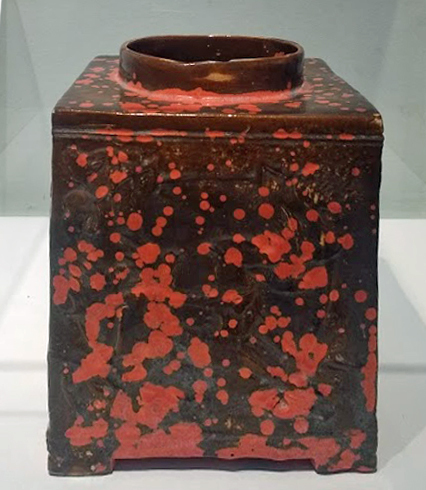 Denise Wren, square pot with incised deer and “stormy sunset glaze”, 1930s. Denise Wren, George and the Dragon, 1920s. 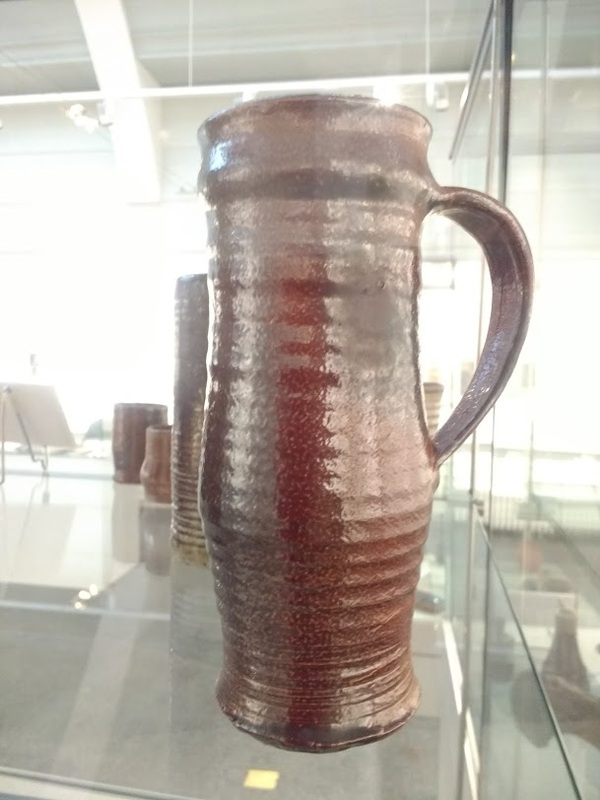 Salt-glazed jug by Denise Wren. She exhibited her innovative glazes at the Craft Potters Association. The Guild’s principles as applied to pottery were: “A piece of pottery is as much of a work of art as a picture. Therefore each of the pieces shown has been made by the designer. 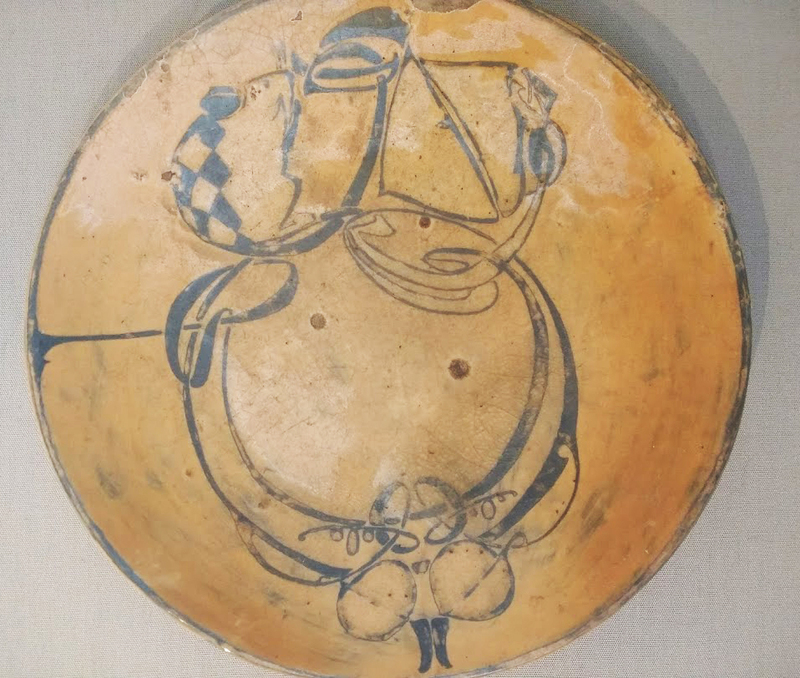 Each is the only one of its particular pattern.” It has to be said that Wren’s early pottery was clumsy and badly made, but that applies to many of the early studio potters. 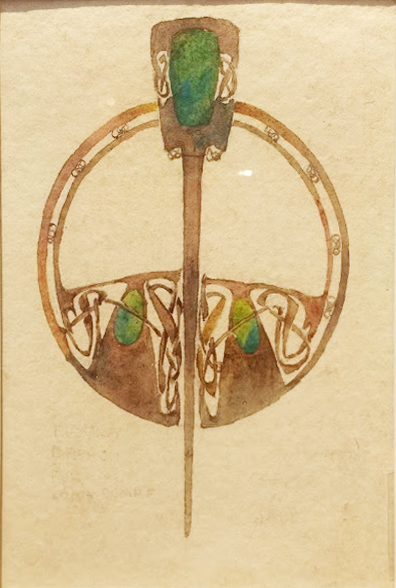 Her application of Celtic and Art Nouveau patterns was original and unique. She achieved interesting glaze effects. In the 1950s, she and her daughter introduced salt-glazing to studio pottery, where is is now widely used. The little animal figures that she made towards the end of her career were artistically and commercially successful. * Cayley Robinson, Gertrude Cohen, Annie Maule, Rachel Marshall, Winifrid Williams, Deborah Harding, Stella Crofts, Nora Braden , Sybil Finnemore, Zema Haworth, Olive Jones, Enid Marx, Ada Mason, Sylvia Fox-Strangways, Katherine Pleydell-Bouverie, Elsie Currie, Miss F. Maggs, Nora Stranaghan, Miss D. S. Bell, Mary R. Brace, Miss J. Williams, Constance Dunn, Mrs R. N. Tagore, Norah Godlee, Doreen Goodchild, Ursula Mommens, Rosemary Dugdale-Bradley, Dorothy Morton, Helen Pincombe, Joan Crossley-Holland and Eleanor Whittall.